Redwood Rainbows began in 2007 as an LGBT club under the auspices of the Saucy Squares Dance Club in Sebastopol, CA. Over time, the clubs merged and dropped the Saucy Squares name. 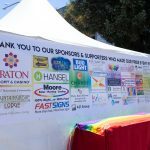 While Redwood Rainbows has its roots in the LGBT community, its members and friends are very diverse and are made up of dancers of all identities. We welcome everyone who wants to come together and enjoy dancing! In 2008 we incorporated as Redwood Rainbows Dance Club, Inc., and in 2009 we received our 501(c)(3) status from the IRS. All donations to the club are tax-deductible. Club membership is available to all square dancers who are at least 18 years of age. Yearly dues are $25, and club members receive a discount on class, workshop and dance fees.